Clifton Heights Police and our Community working together! Come meet and join your local Emergency and First Responders for an evening of fun and games, DJ and food! The Boroughs of Clifton Heights, Aldan, Lansdowne, East Lansdowne and Yeadon announce this year’s Southeast Regional Youth Police Academy beginning March 3, 2016. This training opportunity will again be hosted by Clifton Heights Borough Police Department and is open to the resident of these communities. Space is very limited and will be decided on a first come basis. This application must be completed in its entirety and returned to YOUR own police department. This is a great opportunity for the teens of our community who may be considering Law Enforcement as a career choice. 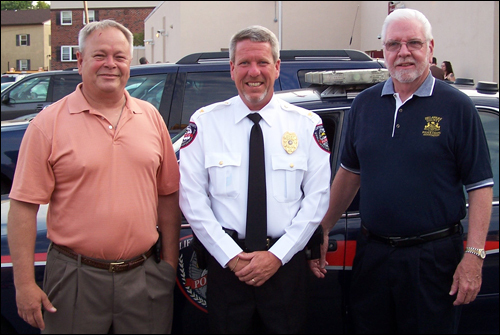 Pictured above are former Chiefs of Police Walter Senkow and Ron Berry with newly appointed Chief of Police Tim Rockenbach who took his oath of office on June 19, 2012. Members of the Clifton Heights Police Department, friends and members of the Police Athletic League recently replaced and upgraded the Dug Out Facilities on the main baseball field on Springfield Rd. 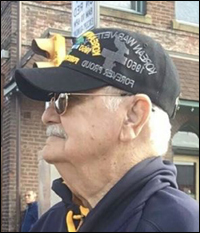 The facility had fallen into disrepair recently and with the help of Home Depot and store manager Dave Tooley, a portion of the materials were donated and delivered for free to complete the project. The project included repairing and replacing the roof of the Dug Outs and re-painting the facility. 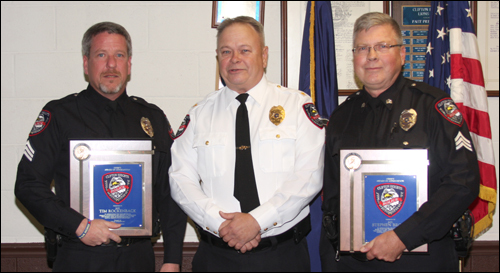 Both awards were presented for their exemplary service and professionalism during Chief’s Senkow’s tenure. 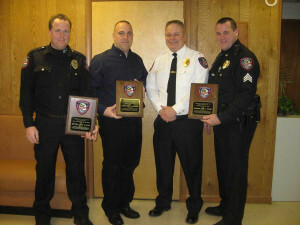 Part-Time Officer of the year 2012 – Officer Kevin Schieler. 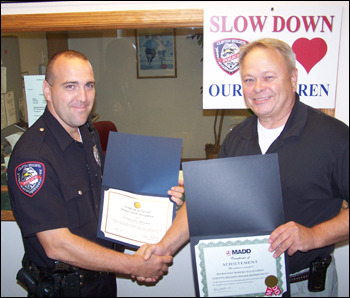 On Friday, February 18, 2011, Clifton Heights Police Officer Kevin Schieler conducted a car stop as a result of suspicious activity called in by an alert resident. During the course of this car stop, events occurred resulting in extremely severe injuries to Kevin. Read More. 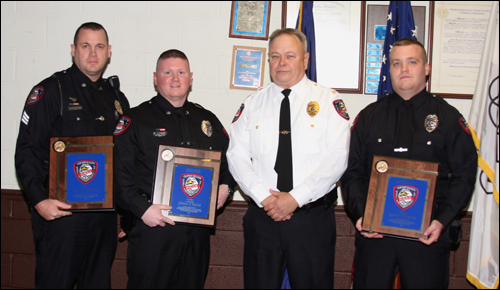 Each year MADD recognizes an one officer from each Delaware County Police Department for his or her efforts at DUI enforcement. Below is Chief Walter Senkow, presenting Officer Robert McCaughan two certificates at council meeting. One is from MADD Mothers Against Drunk Driving and the other from Congressman Joe Sestak in recognition of Officer McCaughan’s achievments and enforcement of violations for Driving Under The Influence. 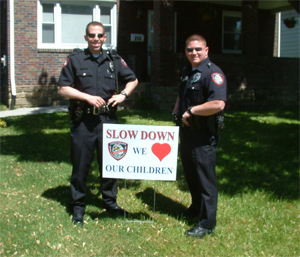 Officer Chris Kammerer (left) and Officer James Press (right), stand next to one of our Slow Down Speed Signs we have placed on various streets throughout the borough. With summer quickly approaching, we ask that all motorists utilizing our streets to please slow down and protect our most precious commodity – OUR CHILDREN. Additional signs are available by contacting the police station.